Numerous reports of severe thunderstorms and wind damage from the north Phoenix Valley yesterday evening. Strong storms and outflow from the Rim kicked off storm development. The outflow shows nicely on the 7:40 pm MST radar above (from NCAR - base scan only). Down here there was one large cell moving along Catalina foothills north of here, with weaker cells near airport and along I-10 east. In Phoenix area, Luke AFB reported gusts to 69 mph with near zero visibility. Graphic below shows the Maricopa County flood district's gauge reports (past 24-hours ending at 7:00 am this morning) with radar estimates overlain from WDT. Note that one gauge with 4.41" was apparently malfunctioning. 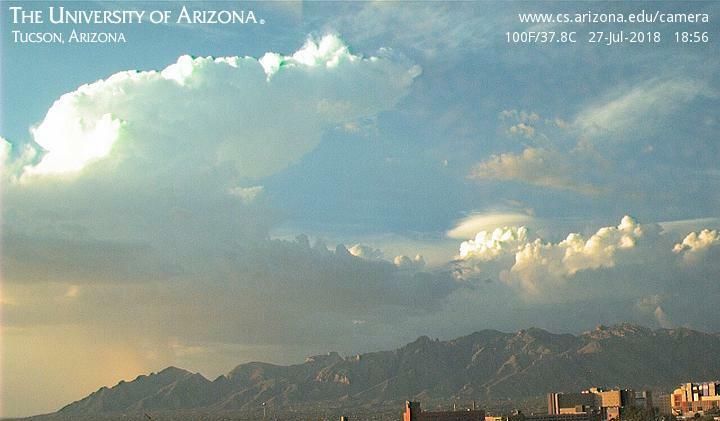 Thunderstorms north of Catalinas at 6:33 pm last evening. The plot below shows detected CG flashes for 24-hours ending at 11:00 pm last evening (from Atmo and Vaisala) - storm in north Valley up in Phoenix metro area stands out. 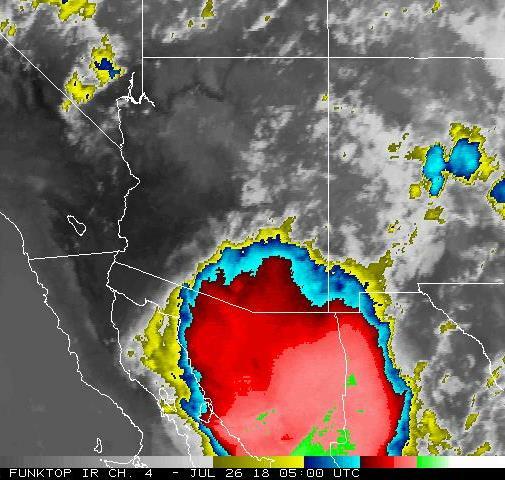 In southeast Arizona storms continued to mostly hug mountains, without enough outflow lift to produce serious storms at low elevations - even though east winds gusted over 40 mph at airport. Southern Cochise County was very active also (1.33" at Ft. Huachuca and 1.89 at Pioner Airfield and 1.06" at Douglas). At bottom is Pima County ALERT map for 24-hours ending at 5:00 am this morning. Once again mostly light rainfall across much of metro area. Here at the house we had thunder and outflows, but only 0.02" in gauge this am. Very frustrating July here in the Rillito Bottoms! This morning there is little CAPE in TWC upper-air data and noticeable drying has occurred below 500 mb. The 06 UTC WRF forecasts have little activity in our area - GFS version has couple small cells in metro area around 6:00 pm, while NAM version has couple of small cells well to south and southwest of metro around 3:00 to 4:00 pm. Like a broken record here in north part of City - moist and sultry but only a Trace of rainfall for past week. 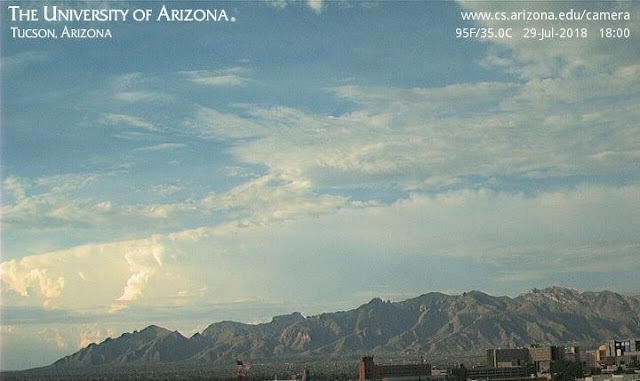 The 6:00 pm MST view from campus yesterday shows very distant Cbs to the north. ALERT rainfall map (below - for 24-hours ending at 7:00 am) shows a bit of rain up in higher elevations and zilch at low elevations across the City. 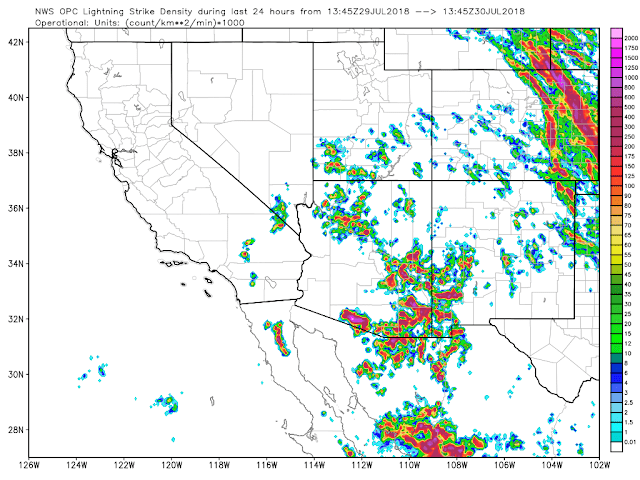 The flash density map (second below for 24-hours ending a bit before 7:00 am from weather.graphics and Vaisala) shows thunderstorm activity occurred yesterday from north to east to south, while most of southwestern Arizona was totally suppressed. Total PW map above is for 12 UTC from MIMIC - extremely high values of PW continue over much of the Southwest - with a tropical system spinning far to south of Cabo San Lucas. The current 500 mb analysis (above from SPC) shows the ridge amplified over the West, with anticyclone centered over Nevada's famous Area 51, with even a hint of inverted trough to our west. The SPC 250 mb analysis (below) has shifted the anticyclone center off toward Puerto Penasco. Morning conditions in our area remain similar to yesterday: high moisture and CAPE but with a chopped up wind profile. Yesterday afternoon radar loops showed many storms propagating along mountains flanks, exhibiting apparent movement from all directions. The WRF variant forecasts from 00 and 06 UTC last evening/night each forecast different convective outcomes today for eastern Pima County. Most spectacular forecast is from the 06 UTC WRF-GFS which forecasts a severe line of thunderstorms to cross the metro area at around dark. Least active forecast appears to be from the 00 UTC WRF-NAM - but bottom line is that high uncertainty regarding when and where storms might occur at lower elevations continues. Below is the 06 UTC WRF-GFS forecast skew-T for TWC, valid at 6:00 pm this evening, with substantial CAPE above a well-mixed BL. However, the vertical wind profile is pathetic. The model forecast indicates strong storms moving rapidly off higher terrain toward the southwest - so outflow propagation seems to be the dominant steering force in the forecasts. Another wait and watch kind of day. I'm off to a late start today. Fewer thunderstorms in eastern Pima County yesterday - a few weak cells in metro area but heaviest activity on north side of Catalinas (ALERT data above for 24-hours ending at 7:00 am MST this morning), and a severe thunderstorm in San Manuel with strong wind gusts and some damage. Lightning flashes again after dark, mostly to north, but nothing like the day before. There was anvil shading by late afternoon, as Mike L. warned yesterday. There was also a strong outflow from storms to south and southwest around 5:00 pm, with gusts of 30 to 40 mph. The airport had 0.02" and DM had a Trace - nothing at Atmo or here. Composite radar chart above is from PHX at 6:43 am this morning. The early morning activity is leaving behind a mess of cloudiness over southern Arizona (visible image below from 7:45 am). Thus, both some low-level cooling and slow heating as negatives for today. The 12 UTC analysis for 250 mb (above from SPC) shows the massive western U.S. anticyclone to be centered nearly over our heads. Stronger winds around the circulation in Arizona are across north portion of state. The morning SPC sounding plot and analysis below shows that conditions today are much like yesterday. High PW and potentially high CAPE, but a very strange wind profile continues with light winds through most of troposphere, except for around 600 to 500 mb. The WRF forecasts I've looked at (from 06 UTC and NAM version from this morning). Are forecasting storms much as yesterday, but with coverage over southern Arizona restricted mostly to Pima, Santa Cruz, and Cochise Counties. Storms around the metro area again mostly hug the mountains, as per yesterday. So it goes. 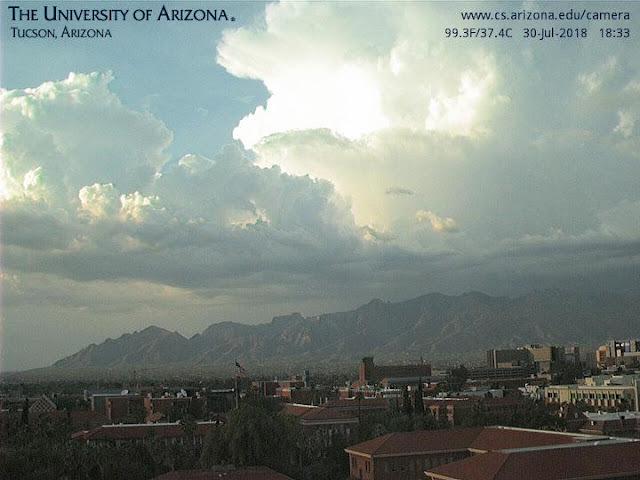 Webcam view to north from campus a bit before 7:00 pm MST yesterday. Nice little pileus above distant tower. Building tower over western Catalinas is quite sheared toward northeast. This reflects the strange wind profile (still present this morning) with strongest winds in lowest third of cloud bearing layer and weak winds above that. By 8:30 pm (composite radar below from that time) large storms had developed on south flanks of Catalinas and also along and south of I-10. The lightning show was quite spectacular, with nearly continuous flashes from around 8:00 to 10:00 pm. The lightning remarks from the raw observations at TUS were quite inadequate, given the flashes going on. The remarks LTG DSNT ALQDS were essentially carried all through the event even though thunderstorms were being reported at the airport - just another aspect of the sorry state of automated weather observations, especially at second tier airports such as Tucson. Plot of detected CG flashes (above, from Atmo and Vaisala) is for 24-hours ending at 1:00 am early this morning. There is one cluster of flashes right over airport, although much of metro was in donut hole again, as storms hugged mountain slopes and re-developed south. The ALERT station plot below indicates heaviest rain amounts over Catalinas and eastern edge of metro area. Central and northwest metro area was skunked again re rainfall, all the way out to Pinal County. Only a Trace her,e although we had a long period of thunder and outflows, along with the lightning show. Airport had 0.21" and Atmo 0.13". This morning's skew-T plot for TWC continues little changed - PW up to 1.75 inches now with considerable CAPE. The wind profile features strongest northeast to east-southeast winds below 500 mb, with very light winds from there up to 150 mb. There has been low-level cooling and considerable heating needed again to get storms going. The 06 UTC runs of WRF models at Atmo both forecast fairly widespread and strong storms again today over much of Pima and Santa Cruz Counties. The NAM version seems more realistic to me (but I've not had much luck past week picking the better model's forecasts), since it does not initiate storms until around 6:00 pm. The GFS version has significant storms underway by around 2:00 pm or so. Rain in our gauge tomorrow morning? Hopefully, since this July seems likely to close out as very dry here at house. First re yesterday - there were a couple of small thunderstorms in the east metro early last night and several ALERT gauges caught light, but measurable rain. Here I watched a bit of lightning around 9:30 pm MST. The 06 UTC runs yesterday of both WRF variants, while in agreement in their model world, were way off in their forecasts of heavy storms after midnight. There was very little activity period for eastern Pima County yesterday. However, there is another nocturnal MCS over and east of the central GoC - IR image below from 6:00 am this morning. The morning 500 mb analysis above (from SPC) shows that the anticyclone has weakened some as heights are lower around the center, which is over the lower Colorado River Basin. A weak inverted trough, or deformation zone, continues from the southern GoC northward across New Mexico. This feature is present only in the 700 to 500 mb layer, but model forecasts do try to inch it westward today. This feature is very moist - as per the SPC morning skew-T plot for El Paso below. The PW within the 700 to 500 mb layer (above from MIMIC at 13 UTC) shows this region of high moisture over southwestern New Mexico, our region and and southward into Mexico. The TWC 12 UTC skew-T below is drier in the BL than is El Paso and winds are easterly. However, with deep moisture the east winds won't be as drying as they are usually. The wind shear profile is quite favorable for strong and organized thunderstorms. Bot 06 UTC WRF variants forecast late afternoon storms for central and eastern Pima County. The NAM version again forecasts another round of very strong storms across the metro area after midnight. That version forecasts development of a moist, absolutely unstable layer aloft after midnight, but the GFS version does not. This kind of unstable structure is often associated with our early morning MCSs - so we will watch all of this evolve today with higher hopes for rain. Outflow from the northeast last evening was strong enough to kick off several small thunderstorm cells over parts of the metro. Here at house there was a nice lightning show around 9:00 pm MST. But several stations in the ALERT network picked up measurable rain (above is for 24-hours ending at 8:00 am this morning) - airport actually had .08". Yesterday's 06 UTC WRF-GFS forecast was quite good, but with the storms getting further into eastern Pima County than had been forecast. 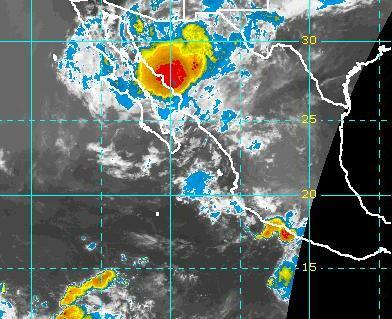 Storms in Sonora developed into a huge MCS (as Mike L. had mentioned as a possibility in his discussion yesterday). IR image below, sent over by Jim Means, shows the MCS cloud shield at 05 UTC last evening. The plot of detected CG flashes second below (from Atmo and Vaisala) is for 12-hours ending at 06 UTC last night. The active storms went into the GoC and caused winds and dewpoints to surge at Yuma beginning a bit before midnight. This surge is one of the complications for today - cool air is over southeast Arizona and the push from the GoC is very warm with lower pressures currently to west. How far east will this air make it today? The 500 mb analysis (above for 12 UTC from SPC) indicates a mid-level, inverted trough from central Baja northeastward into New Mexico. This weak feature was probably at play during the development of the MCS last night. The TWC 12 UTC sounding plot (below) shows both significant increase in PW (up to over an inch and a half) and also outflow cooling. The sounding remained affected by the MCS and local thunderstorm activity. Another key question is that of how the sounding will evolve today - a special 18 UTC sounding could prove very useful; however, there is no mention of possible thunderstorms today or tonight in current NWS forecast for TUS. Both versions of 06 UTC WRF forecasts from Atmo keep thunderstorm activity east and south during the day with little forecast for eastern Pima County. However, both versions forecast a nocturnal MCS across our area after midnight - above is GFS version and below is NAM version, both valid at 2:00 am tomorrow morning. The other various WRF forecasts indicate several features converging over the metro area by midnight: the surge boundary from west, an outflow from the south-southeast, and an outflow off the Catalinas. Complicated mesoscale details fairly far out in time - but will undoubtedly be interesting to see how all the various features actually develop and interact. 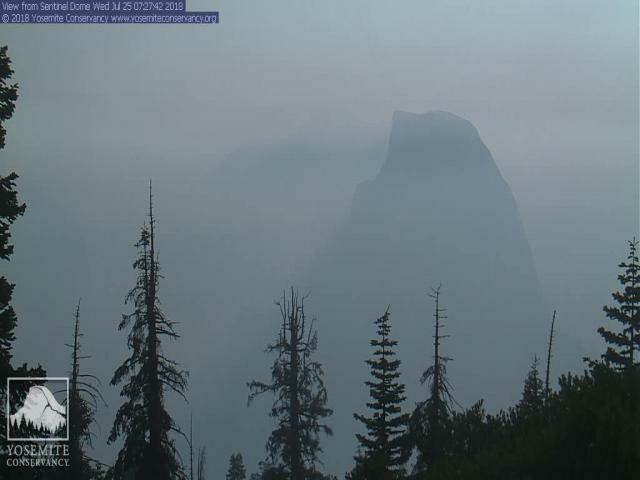 Yosemite NP is closed for rest of week because of a large wildfire - photo above is of Half Dome in the smoke this morning (from Jack Hales webcam wall). Map below shows high temperatures recorded yesterday - magenta indicates 100 F and higher! Note that TUS high was 112 F, and 113 shown on map is high from DM AFB. Composite radar chart above is from 6:45 pm on July 24, with echoes about as predicted by WRF-GFS (see yesterday's post and CGs below). Plot of detected CG flashes (below from Atmo and Vaisala) is for 24-hours ending at 5:00 am MST this morning - warm colors are from yesterday afternoon, while cool colors are from early morning yesterday. Plot above is of GPS PW from campus for past seven days - the big drop in PW occurred on Sunday with values dropping from mid-40 mm to around 30 mm this week. Interesting forecasts for this afternoon from the 06 UTC WRF-GFS run at Atmo. The composite radar forecast above is valid at 5:00 pm this afternoon, indicating strong storms over higher elevations of all of southeast corner of Arizona. The two forecasts below of skew-Ts for this afternoon show why the model keeps the storms on the mountains. Just below is for TWC at 3:00 pm - the surface based BL reaches to 750 mb and has CAPE but no apparent way to release that CAPE with out a very strong outflow from east. But the elevated BL from 750 to 600 mb has CAPE that could produce storms over higher mountains. The forecast at bottom is for Mt. Graham valid at 1:00 pm and indicates that thunderstorms are probably about to develop there. Big difference in potential for storms today from high mountains into deserts. High-based thunderstorms and light showers have been drifting around southeast Arizona during the night. Photo at top is from a bit before 6:00 am MST and is looking across Redington Pass toward San Pedro Valley. The NWS composite radar display just above is from 7:00 am, with strongest storm over near Kitt Peak. 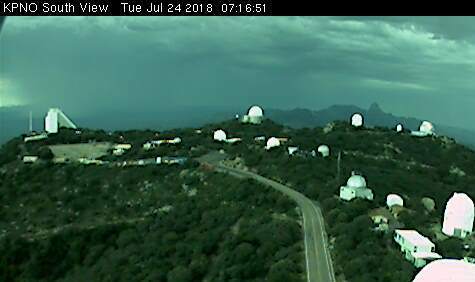 View below is looking south from Kitt Peak at 7:17 am. The CG flash density plot second below is for 12-hours ending at 7:00 am this morning (from weather.graphics and Vaisala). Even the puny Cb shown at top produced a few CG flashes. The morning skew-T plot for TWC upper-air data (above) has PW of 1.23" (31 mm) and a moist layer from 600 to 500 mb that has some CAPE (see MU - most unstable) calculation above. The PW had briefly dropped to around an inch late yesterday, with dewpoints in the upper 40s F. Winds in middle-levels are are light as intense anticyclone edges westward toward our area. The two WRF forecast runs from 06 UTC last night are quite different. The GFS version above forecasted the early am shower activity reasonably well, but forecasts little activity during the afternoon today (forecast of composite radar echoes above valid at 7:00 pm - model does forecast some nocturnal activity again tonight over mostly Cochise County). Note that the GFS forecast sounding for TWC at 6:00 pm has 26 mm PW and mixed layer CAPE of 20 J/Kg. The NAM version (below, also valid at 7:00 pm) forecasts strong thunderstorm activity over eastern Pima County. However, the NAM forecast sounding for TWC at 6:00 pm has PW of 36 mm and mixed layer CAPE of almost 500 J/Kg, accounting for the differing forecasts. My guess would be that the GFS version of WRF will play out closer to reality this afternoon and tonight. So Much For The Morning Soundings! East Winds And then Storms By Weekend?